I have known Tallia since we were kids, fangirling over pop boybands (she was definitely a Backstreet Boys girl & I was *NSYNC). You would think that after having known each other for almost 2 decades as family friends, we would know all there is to know about each other. But, that couldn't be further from the truth. See, sometimes we take the ones closest to us for granted. We don't really explore their depth or see them through a fresh pair of eyes as they grow and evolve over time. The Tallia I know today is not the same Tallia I knew from childhood. She has picked up her life and moved to new cities twice, once for undergrad in D.C. and then for graduate school in Claremont, California – not to mention the time she lived out of her suitcase & traveled across the U.S. as a consultant. I can tell that with each changing experience, there was an internal change as well – a search for new meaning, a coming home to one's true self. 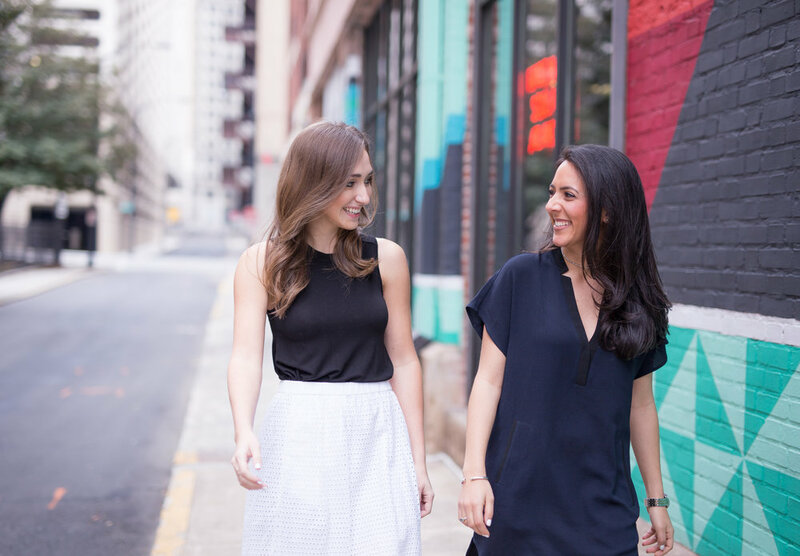 Since then, she has returned back to her roots as a Georgia peach and, along with Kate Gremillion, is the co-founder of Mavenly –a career consulting firm tailored for young women that helps build both practical and interpersonal skills. During our conversation, we discuss Positive Organizational Psychology, the importance of balancing both positive & negative emotions, love, spiritual identity & more. And for the first time, I see my old friend with a fresh pair of eyes. Thank you to Tallia for sharing your mind. My kryptonite is: cheese puffs! MN: Psychology has become a popular career choice and an even more popular topic of discussion with the Mindfulness movement. How did you find your niche in Positive Organizational Psychology and what lead you to Mavenly? How does Mavenly make a unique impact in the lives of women? TD: I always knew in the back of my mind that psychology would be the path I’d end up exploring. During my time in college, I got most of my energy from connecting to people and building relationships, whether that was in an acapella group or in Greek life. Upon graduation, I was hired as a leadership development consultant and had the incredible opportunity to travel to over 25 universities to meet with women in college and found that so many important conversations about life after college weren’t being had. I reflected a lot on my experience traveling and recognized that I loved helping people recognize their strengths and define success for themselves, particularly on an organizational level. While I was on the road, I was reading a book called Flow: The Psychology of Optimal Experience, which was when Positive Psychology fell right into my lap. With Positive Psychology, you take a strength-based approach to psychology that seeks to answer two questions: “What makes life worth living?” & “What do people need to thrive in their work and life?” I became fascinated by these questions and needed answers! MN: The majority of individuals you work with are Millennial women. What do you think are some defining characteristics and needs unique to our generation in the workforce when compared to our parent’s generation? TD: What I’ve come to realize in the work I do coaching both women and men is, contrary to popular belief, our needs as a generation aren’t that unique. We search for purpose in our work, environments that foster intentional cultures, and causes to stand behind. These aren’t "millennial" characteristics; they are basic human needs. The danger comes when we create more reasons to separate groups of people. To me, that only leads to more problems. What is different about our generation, particularly in regard to work, is that we have more options. With the paradox of choice, we know that when people have more options, it’s not only harder to make decisions, but we tend to doubt our decisions even after they’ve been made. Social media doesn’t help because we’re constantly seeing what everyone else is up to. This leads to us questioning our own paths and being tempted by everyone else’s definition of success. MN: Happiness. We are living in the age of “Think and Be Positive” where everyone seems to be searching for a way to find joy. As a professional, what role do you think negative emotions play in establishing self-awareness? How can someone release negative emotions in a healthy way without suppressing them or allowing them to become consuming? TD: YES! This is such an important question. Just because I’m a positive psychologist doesn’t mean we don’t acknowledge negative emotions. It’s important to recognize that negative emotions serve a function; they are there to tell us something. In terms of how to deal with negative emotions, the process is simple. First, recognize what you’re feeling and label the emotion. Many of us wallow in feeling bad, but “bad” isn’t an emotion, so get to know your feelings. If it’s easier to detach yourself to label the emotion, think of yourself in the third person. Ex. What’s Tallia feeling right now? Second, ask yourself what function the emotion is serving? What is this negative emotion trying to tell you? What information can you gather from it? Third, try to unpack what thought is leading to that emotion. Many times, our negative feelings stem from thoughts that aren’t even true (a.k.a assumptions and lies). If you can remember that there is nothing more important than you feeling a positive emotion, be intentional about what thoughts you want to fill your mind with. Lastly, don’t feel like you have to sit with/process your negative emotions alone. I have my own coach, therapist, and support system. If there’s one thing that connects every single human being on Earth, it’s that we all experience a spectrum of emotions that we can each relate to –good or bad. MN: What would be your advice to a Millennial whom feels “stuck” or in a rut in life? What do you think is the first step in making a commitment to change & progress? TD: Take a step back and reevaluate. When we feel stuck, we tend to think about all the things we don’t like about our situations and all the things we wish were different. Instead of clouding your headspace with what you don’t like/what you don’t want, practice thinking in the affirmative. What do you want to think, see, feel, or do instead…and more importantly, why? Without knowing the why behind what we want, it’s easy to be misguided onto a path that looks good or seems better in the short-run. The key is to align yourself with your values and understand what a full and thriving life looks like for you, and then take action to get you one step closer. MN: Would you consider yourself a spiritual person? Do you believe that someone can be spiritual, yet not religious? TD: The commonalities I see between spirituality and religion are that both of them are a practice and both of them connect you to something bigger. I do consider myself a spiritual person more than a religious person. The main difference I see here is that when you ascribe to a religion, you’re taught a belief system or to follow a prescription, if you will. To me, spirituality is whatever you want it to be. With spirituality comes the personal power to define what it means to you, and for me it’s become my unique way of looking at the world and feeling the interconnectedness and unity of everything. MN: Living in the diverse and rapidly changing world that we do today, what are some ways in which we can promote unity and greater compassion? TD: I always say that empathy will solve all the world’s problems, and I stand by that 100%. Aside from that, it’s interesting to note that our generation is the least likely to belong to a formal religion. What I fear we are losing because of that is community and a common sense of belonging to something greater than ourselves. I think we need to find causes to come together around, however big or small, and spaces to have conversations about our joys, our challenges, and our humanness. MN: Where do you think fear comes from? How does it affect your decisions in life? How do you deal with it so that it makes you a stronger person? TD: Fear, just like every other emotion, serves a function. To me, fear is a reminder to trust. Whenever I feel fear creeping in, I stop and ask myself: “What do I need to trust here,” & “What am I actually afraid of?” When you begin to put words to your thoughts, that’s when you realize 80% of your fears are not based in truth. When you learn to trust is when you start to cultivate resilience and agency. MN: How has a moment of vulnerability served as a catalyst for growth and ultimately inspiration towards reaching your potential? TD: Vulnerability seems to be a buzzword these days, and it comes up a lot in coaching with my clients. What’s fascinating is that the definition of vulnerability is "the state of being exposed to the possibility of being attacked our harmed, either physically or emotionally." I think this definition shows us that vulnerability is tied to fears –fear of judgement, fear of uncertainty, fear of rejection. The irony of it all is that so many people feel alone in their experiences (good or bad), and at the same time have so much resistance to be vulnerable. How can you expect to connect to others and build meaningful relationships without being vulnerable? MN: Do you feel that how you project yourself is an accurate reflection of how you see yourself? How so? TD: I think I am continuously engaged in the process of self-discovery, as most of us are. What this means is how I project myself and how I see myself are both constantly evolving. We all have to be willing to have "mirror moments" –moments of staring at our reflections (literally or figuratively!) in the mirror where we ask ourselves what we see, both on the outside and inside. What do we see that we don’t like and what does that mean? What do we see that we do like and what does that mean? What don’t we see that we want to see? Self-reflection is the name of the game. MN: Love. First off, you recently just got engaged! Congrats!! What has your dynamic with your fiancé taught you about “love”? What's your take on the modern concept of “soul mates”? TD: AHHHH!! Thank you! My relationship with my fiancé has taught me that love plays a role in many ways in our lives, but the most important relationship you have with love is between you and love itself. To truly understand love is to recognize that you have to be open to receiving love, not just from others, but also from yourself, before you can give love. I do believe in soul mates, and I do believe that Parsa is one of my soul mates. I don’t believe that we only have one soul mate, nor that soul mates have to be related to romantic love. To me, being soul mates with Parsa has a deep spiritual component that transcends this lifetime, and that brings with it a sense of knowing where we’ve been, where we are, and where we’re going –together.